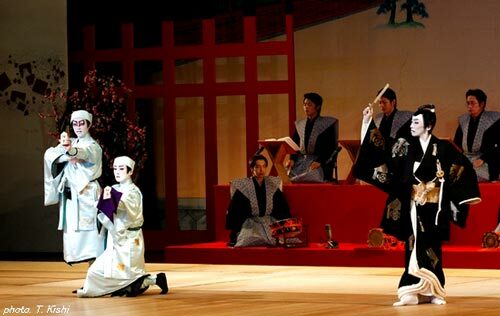 The original title of this dance was "Taimen Hana no Harukoma" and it was premiered in the 1st lunar month of 1791 at the Nakamuraza at the end of the new year program "Haru no Sekai Nigiwai Soga" [casting]. In modern times, it was revived in January 1954 at the Shinbashi Enbujô and was entitled "Ataru Toshi Iwau Harukoma" [casting]. The Kudô household are celebrating the appointment of their lord Suketsune as the supreme official in charge of the imperial grand hunt in the foothills of Mt. Fuji. Retainer Kobayashi no Asahina, courtesans Ôiso no Tora and Kewaizaka no Shôshô are performing a congratulatory dance around Suketsune, when Asaina informs the latter that there are two brothers he would like him to meet. Having gained the lord's consent, he calls out and there appear from the hanamichi the Soga brothers, Gorô and Jûrô, who then perform a dance at the request of Suketsune. At Asaina's suggestion, Suketsune decides to give a present to the two brothers and throws something in a silken wrapping. When the brothers pick it up, they find inside the wrapping, to their great joy, two tickets for admission to the hunting ground, where they will be able to seek out Suketsune and avenge their father's death.